If you've been reading this little blog for awhile, you know by now that I enjoy baking, decorating, and crafting. I bet that you didn't now that I love wearing scarves! Wearing a scarf makes dressing so much easier. A scarf, cardigan, t shirt and jeans is my go to outfit. I always feel put together when I wrap that scarf around. In fact, a scarf is kind of like a cherry on top of a sundae! One of the best things about scarves is that you can tie them all different ways. Not sure how to tie a scarf? 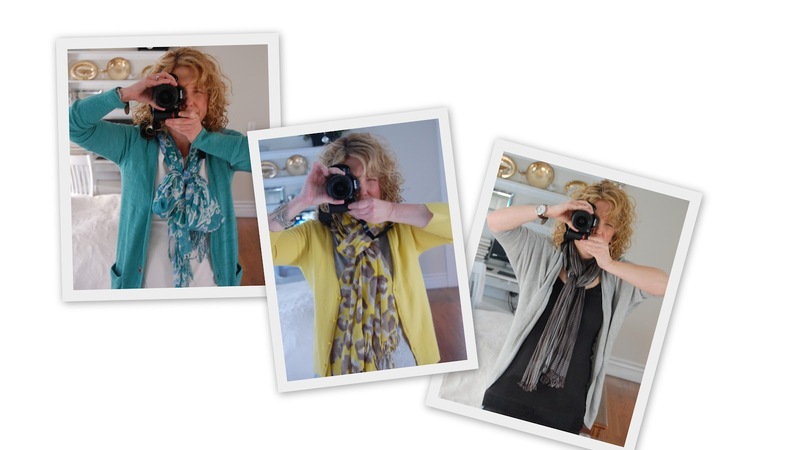 Check out this great this great website, 15 Chic and Creative Ways to Tie Scarves. I love wearing scarves too! But it's been such a mild winter it has almost been too hot to wear one here. I know people wear them all year long but I get rather hot with one on. Looking forward to checking out that site. I like to double mine, twist in the middle and then run one of the ends through the twist. Looks like what you did in the 2nd and 3rd photo. Cute! We are definitely with you when it comes to scarf wearing!! Number 14 for us and we are all year round scarf wearers. Wool for winter and Linen for Summer, a scarf is such a fun way to jolly-up one's clothes and add a splash of colour if one is in the mood. Adorable...I'm right there with you. I often wear them...my favorite right now? A cotton one knit that has a "woodstock" feel to it..I'm not quite that old (almost) but it makes me remember wilder days. Thanks for the link - I'll be checking it out...love your photos. cute pictures. My girls and I love scarves too! I will go check out your link. thanks. Aren't you adorable with your lovely outfits and scarves. how cute are you in your scarf! You are right, they really finish off an outfit. Checked out your link, very cute. You cleaver, cleaver girl...I love the photos. Yes, you are so right, scarves really jazz up an outfit. Now I am off to check out the web site! Awesome! I love scarves too! Your yellow scarf and cardigan are especially cute! You look fabulous in them too! Cute pics! This is good info. All I do is loop my scarf one end over the other. Now I'll have more options. I love to wear scarves too. They are that accessory that help tie everything together. Your pictures are cute. Happy first day of Spring. Beautiful scarves! Cute pics. Hope you are having a great week!! I am wearing a scarf today, i am scarves fan! your's look great! I only thought there was one way. I like all the different ways though. It's cute to see someone tying them up differently.